When Prima Tooling recognized the exponentially increasing demand for PCD tooling, the company invested heavily in Vollmer machine tools to support cutting tool production. However, the Essex based cutting tool manufacturer that opened its doors for business in 1979, first noted the demand for PCD tooling back in 1985. Like other cutting tool manufacturers, Prima was limited throughout the 1990’s by the available technology for processing tools and in 1997 it bought its first Vollmer erosion centre, a QM75P with a 50-tool magazine. Despite being state-of-the-art at the time, the machine only had the capacity for one tool shank diameter, still limiting the company’s capabilities yet improving productivity and profitability tenfold. 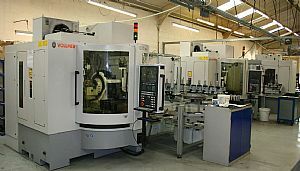 The company continued much of its PCD erosion on a series of ageing Agie EDM machines – until 2006. At this point, the Brentwood based cutting tool specialist made a paradigm shift and acquired a new Vollmer QWD750H erosion centre with a 12 tool carousel for cutting the profiles of its PCD tools. The purchase immediately scrapped four Agie EDM machines – and the new machine proved more productive than the four machines it replaced. Unlike its manually loaded predeccesors, the QWD750H is a fully automatic erosion machine that enables Prima Tooling to load the 12 tool carousel, allow automatic production to take place and then unload completed tooling. 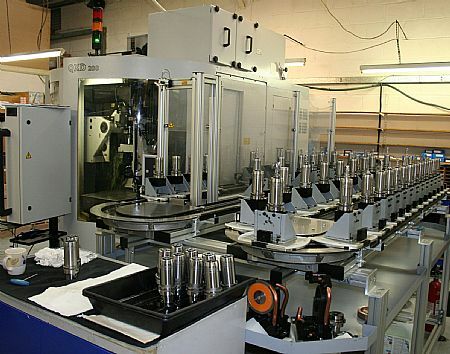 This acquisition enabled Prima Tooling to improve the accuracy of its tool profiles, reduce cycle times by 60% on each tool whilst increasing the available floor-space by replacing four machines and enabling staff to be allocated to alternate tasks as opposed to continually loading the ageing machine tools. A long way from the Vollmer machines of the 1980’s, the QXD200 with 6 linear axis and capacity for six erosion or grinding wheels, has the flexibility to process tools from 0.4 to 260mm diameter. This allows 9 employee Prima to manufacture anything from PCD routers and end mills, profile cutters, grooving, slat-wall, edge-banding and profile spindle tooling through to PCD saw blades, hoggers, hinge borers and drills for the wood and metal cutting sectors. 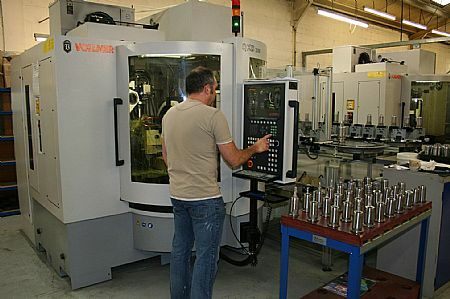 The first QXD made such an impact at Prima, that within a matter of months, the company decided to invest in yet another machine.